Idea list and a new community Facebook group! Back by popular demand, I am bringing back the Idea List and this time I am creating a facebook group to go alongside it. For those who are new to the blog, the Idea List is a list of ideas (suggestions), which aim to encourage you to organise your home, your life and also to remember to have some fun each month. It will be published on the blog near the end of each month so that it is ready for you before the first of each month. There is an idea for each day of the month and it is up to you how much you follow the list. Sometimes, the ideas may not be relevant to you or you just may not want to do some of the ideas and that is fine. When it comes to wanting to get organised there are often two types of people. Some have lots of ideas and are good at planning but lack energy and commitment to follow through and actually progress. Others have lot’s of energy, motivation, and self-discipline but struggle with working out where to start and the best ways to get things organised. Therefore, I thought that a great idea would be to start a group where we could all get together and help and support each other. Those of us who are natural planners can help inspire with ideas and help solve problems that people may have and those with lots of energy and motivation can keep us accountable and cheer us on to keep us on track. Each week I will post the weeks ideas as a reminder and we can use that post to discuss what parts we are doing and to help each other. 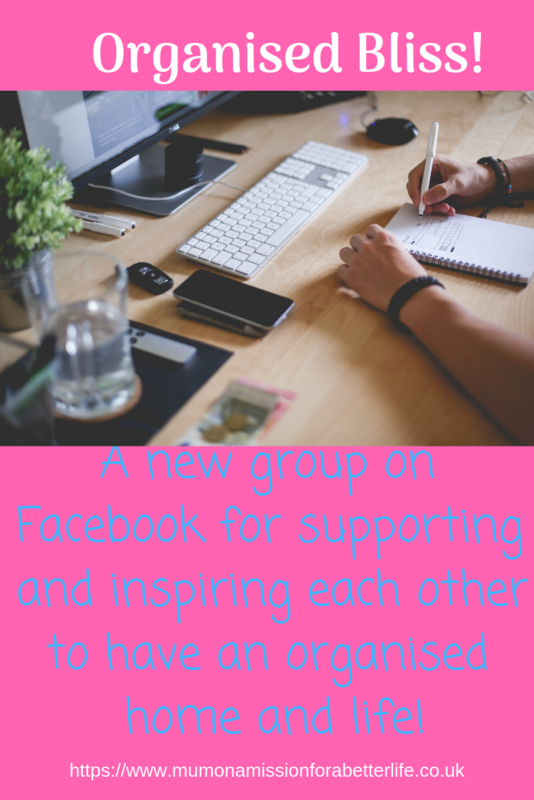 So, the group is called Organised Bliss and I hope that you join me there. Also, it would be great if you could share this group on social media to help let people know about it so that we quickly get lots of members to get things going. I am really excited and I hope that you enjoy the return of the Idea List and the new group. Februarys Idea List will be going live on January 30th 2019, so make sure you check back then if you want to be one of the first to see it!